There are several things in the world of Three Investigators collecting which can be considered unusual and perhaps even rare. I believe the word "rare" is often overused by people selling Three Investigators books. And simply because an item is "rare" does not necessarily mean that it is priceless or worth a great deal monetarily. 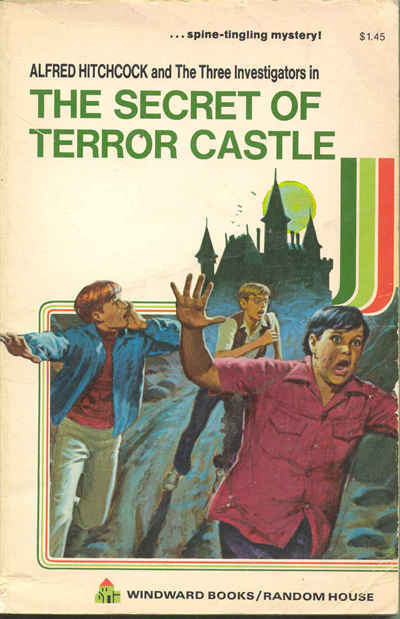 I do not consider any particular Three Investigators title to be rare but there are some formats of particular titles that I would classify as rare. 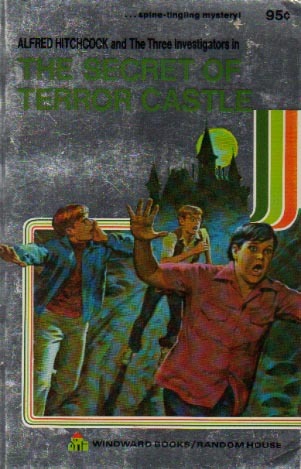 For example, the two titles which appeared as Windward Silverback books ("Terror Castle" and "Stuttering Parrot") are scarce but the Windward White-Cover books are perhaps the rarest of any Three Investigators books. On the surface it would seem that the Windward White-Cover books would also be the most expensive Three Investigators books to purchase but this is NOT the case. Why? Because most fans/collectors just want one copy of each title and both "Terror Castle" and "Stuttering Parrot" are quite plentiful in other formats at a very low cost. To the handful of collectors who must have every title in every format, a White-Cover Windward purchased for $20.00 or $25.00 is a bargain indeed when compared to any of the high-number GLB's which can sell for hundreds of dollars each and are much more common than either the Silver or White Windward books! In this section, I will present some things to look out for that I consider to be rather unusual or rare. If anyone knows of any additional items that exist and pertain in some way to the Three Investigators, I would be interested to know of it, please contact me at [email protected]. 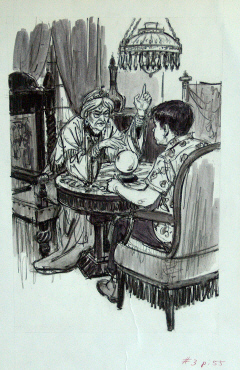 What Three Investigators fan wouldn't enjoy having one of Harry Kane's (Harry Kirchner) original black and white illustrations hanging above his desk? 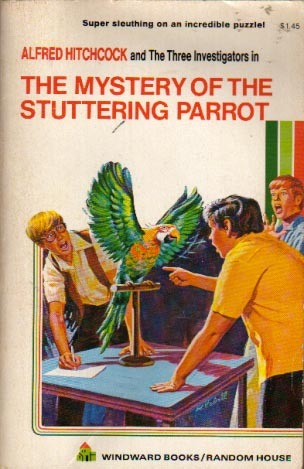 Where is all of the original Three Investigators art that has been used over the years? According to Stephen Marchesi and others I've talked with, prior to the 1970's it was quite common for book and art editors to keep artwork used in and on books - often selling it or passing it along to friends or associates. Sometimes the artwork was destined for the trash bin once it was used. In a telephone conversation I had with Three Investigators illustrator Ed Vebell (Saturday, June 30, 2001), he confirmed these practices and expressed his contempt and disdain for those in the publishing world who "stole" artist's work. 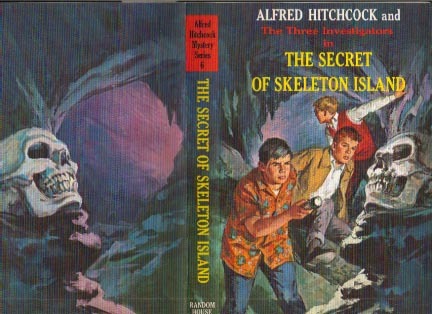 About half of Harry Kane's artwork for The Three Investigators series was discovered in New York City in the summer of 2003. Click HERE to learn more about Harry Kane and his fantastic Three Investigators artwork! Learn more about Stephen Marchesi and his cover art created for the 1978 Three Investigators paperback edition by clicking HERE. And learn more about Roger Loveless and the cover art he created for the 1990's cover art for the paperback "Bulleye" edition HERE. 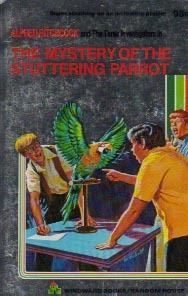 Some fans/collectors might consider this the Holy Grail of the Three Investigators books - until they have one. It is definitely difficult to find but never seems to match it's psychological expectations when sold at auction. Click HERE to learn more about it. There are two boxed Three Investigators sets that were sold in the U.S.
Click HERE to view them and find out more about them. Not particularly of great value are the numerous manufacturing oddities that seem to abound with this series. It is not unusual to find books where the text has been bound backwards and upside-down to the covers. Perhaps their penchant to overlook manufacturing defects led Random House to find and use manufacturers other than Colonial Press, Inc. Re-bound library books that have the cover art from "Moaning Cave" but contain the title and text for another mystery are fairly common, see the example at left. I have seen a handful of books printed in 1981 that contain a Review Form from Random House. I would guess these to be quite scarce to find intact. Click HERE to view a Review Form and Copy and find out more. Any Three Investigators books autographed by the author or even one of the artists are quite scarce. Especially books signed by Robert Arthur, Alfred Hitchcock, M.V. Carey, Kin Platt or Marc Brandel as they are now deceased. Unless one is familiar with an author's handwriting, has personally seen the author sign the book, or can somehow ascertain without a doubt that the signature is authentic, one should be skeptical of paying large sums for any book "author-autographed". 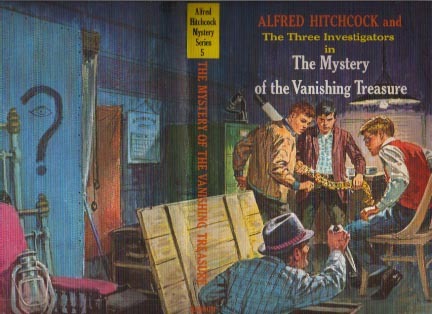 I own a number of Three Investigators books which have been autographed by Alfred Hitchcock, authors Dennis Lynds (William Arden), Gayle Lynds (G.H. Stone), Bill McCay, Peter Lerangis and German author Andre Marx. I also have Three Investigators books signed by artists Stephen Marchesi, Ed Vebell, and German cover artist Aiga Rasch. Some books contain both the author's and artist's signatures. You can view a few examples by clicking HERE. book for profit or personal gain. BOOK INTO THE PLANT OR OFFICE. A printer's proof of the cover art used for a book would be submitted by the printer to the Random House Production and Art Departments for approval of printing quality, color, size, etc. These were printed on the same material used for the books and generally trimmed to the proper dimension of the book. The two proofs pictured below were purchased from former Random House book designer Jackie Vedovato (Jackie Corner). These were the first two books she designed for the Three Investigators series in 1966. Note that these two proofs do not have back cover lists printed on them. (Please note that my scanner was not quite large enough to accomodate the entire proofs.) There were about a dozen different cover proofs mixed in with the collection of Harry Kane artwork in New York City. Books can be found that were designated as "Random House Reading Program" books. A little pocket inside the book contained cards with various questions about the book. Generally the cards are missing. More information on these is forthcoming soon. 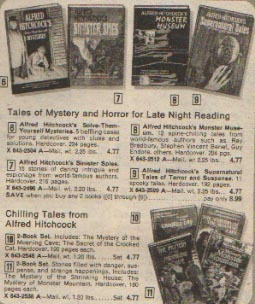 Printed Three Investigators advertisements found in catalogs distributed by Sears, J.C. Penney, and other mass-merchandisers from the mid-1960's to the late 1970's are fairly common and give us an idea of which titles Random House was heavily pushing in a given year. Often, these titles were not the latest titles released. For example, the ad below (at left) is from the 1976 J.C. Penney Christmas catalog and there is no mention of either "Death Trap Mine" or "Dancing Devil". Instead, we see "Moaning Cave", "Crooked Cat", "Shrinking House", and "Monster Mountain" being sold in sets of two for $4.77. Because it was disposable, any Three Investigators advertising used in retail bookstores or libraries is quite rare. Posters (like the one shown to the right, courtesy of Rocky-Beach.com), dumpboxes, counter signs, bookmarks, ANYTHING related to the Three Investigators would have value to a collector. What do you have? 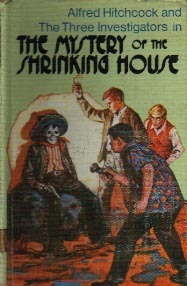 Original Harry Kane illustration from "The Mystery of the Talking Skull". Collection of Seth T. Smolinske.